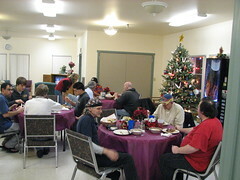 We took advantage of a somewhat quiet Christmas Day to help serve a dinner at the Benedict House in Bremerton. Our church, along with many others in the county, take turns providing meals for homeless men who are temporarily housed at the Benedict House. Esther and a couple of others spent the afternoon cooking up a prime rib roast, potatoes and veggies. The boys and I joined in serving and eating the meal. The men were appreciative and friendly. It was an added treat to drive through snow on Christmas Day.